John Steele is an agent with American Intelligence. Exactly which department he is connected with is never revealed. He is called in on his first set of adventures by the military leaders of NATO but he comes dressed in civilian attire and when he is introduced by the man giving the briefing, he is only identified by name and by the title "Freedom Agent". Very little is revealed in any of the missions we can see him perform. From his appearance it would be safe to assume he is in his mid 30's. This is further evidenced by his calm and mature manner (not brash or anxious at all) and when it is pointed out that should he be captured, he was decidedly on his own, Steele did not look at all surprised or put out. His age is not likely anymore, though, because in his first recorded adventure he is shown to have a terrific physique complete with washboard abs. Steele is an expert with languages. In one mission he must impersonate a Russian guard to infiltrate a secret facility and he does so without anyone becoming suspicious. In another he is sneaking into Chinese controlled Tibet and he is able to converse with the people smuggling him in as well as understand what Chinese guards are saying. Finally, in the last adventure we can follow, he must take the place of a Latin American dictator, clearly showing an intimate knowledge of Spanish. Steele is definitely a man of action and self-reliance but he is also quite intelligent and resourceful. When faced with apparently invisible opponents, he picks up readily the science thrown at him. Similarly when stuck behind the Bamboo Curtain with a broken radio and a need to signal his bosses, he is able to tinker enough with it to get is working again, albeit for just a short period. Where Steele comes from and where he heads when he is off duty is never revealed. What is shown is how much excitement routinely heads his way. 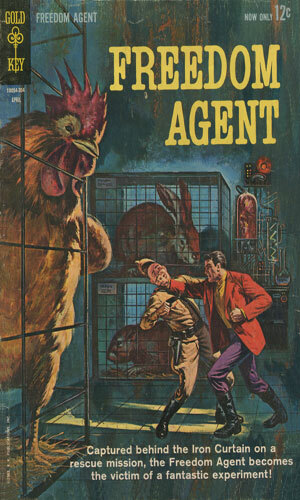 K.K.Publications, operating under the brand Gold Key is best known for its television and movie tie-ins but it did its own share of original works. The two separate but connected issues that make up this entry prove that. Initially it was Freedom Agent that hit the shelves but if it was planned to be a series, it obviously never made it. However, 1 1/2 years later, two additional stories about the same man were released in a 'series' that never made it past the initial issue but at least gave star billing to the character's real name. The Giant Makers - 15 pages - Smuggled film out of the Iron Curtain shows a lab doing research in incredible growth hormones. John Steele is ordered to infiltrate the facility and free the scientist behind it. Escape From The Top Of The World - 11 pages - John Steele, Freedom Agent, is sent via Nepal into Tibet to investigate a 'fireball' that crashed there. Behind Enemy Lines - The Heavy Water Raid - 4 pages - graphical recount of efforts during WWII to stymie the German atomic work. The House Painter of Caen - 1 page text story of a man who uses the guise of a house painter to steal fortifications from the Germans. Seagoing Vessels - Ships of Egypt - short history of Ancient Egyptian vessels. Seagoing Vessels - The Arab Dhow - short history of the Arab type of ship. The Unseen Foe - 14 pages - John Steele is brought in to investigate a team of saboteurs who have a special edge - they are invisible. Double for Danger - 13 pages - To unseat a Latin American dictator, John Steele uses a great disguise to assume his identify. Note: to read these pages, check out BeachBum Comics. It is well worth a lot of visits. 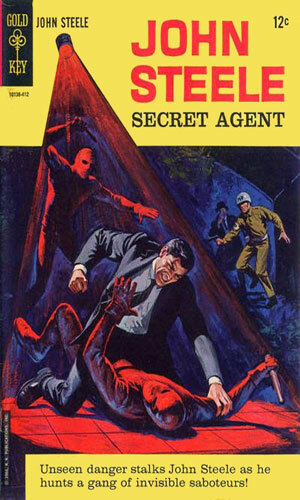 When my good friend and frequent contributor, Johny Malone from Una Plaga De Spias, sent me information on this spy, I couldn't wait to learn more, especially since he also included a link to BeachBum Comics. That highly enjoyable site not only let me see the two adventures in the second issue but then occupied quite a few hours of considerable enjoyment reading lots of other comic-book and such material. I recommend both sites strongly. The character John Steele deserved a lot more attention that he got. The series had a wonderful combination of science fiction thrown in with spy craft and gave us readers a solid, dependable, and interesting character. Alas, two issues containing four adventures were all that were coming.